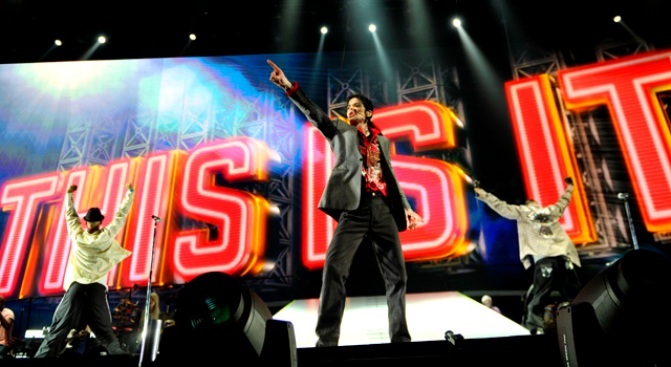 Fans will get a glimpse of one of the greatest music video artists of our time during the biggest night in music videos – Michael Jackson's "This Is It" trailer will debut during the 2009 MTV Music Video Awards. MTV is partnering with Sony Pictures Entertainment and Sony Music Entertainment to exclusively premiere the official trailer from the highly anticipated "This Is It" during the VMAs on Sunday, September 13, 2009 at 9 PM EDT, MTV announced on Thursday. The poster for the film, which was released on Wednesday, features the King of Pop's iconic silhouette, filled in with images from the film. "This Is It" is compiled from hours of footage of the late star's rehearsals for a tour of the same name that was never realized due to his untimely June 25 death. The star had been rehearsing at Staples Center for the 50-date tour, which had been slated to take over London's 02 Arena beginning last July. The trailer debut will provide audiences their first look at the extraordinary new film that opens worldwide in theaters for a two-week limited engagement beginning October 28, 2009.